Not much wisdom to share today. Just a lovely summer salad of beetroot, apples and celery that I keep on making. The textures of these three ingredients provide layers, and so do their flavors: earthy from the beetroot, tart and fruity from the apple and that indescribable taste of celery just adds enough counterbalance to the rather sweet beetroot and apple. The lemon juice and honey in the dressing bring out all those flavors. 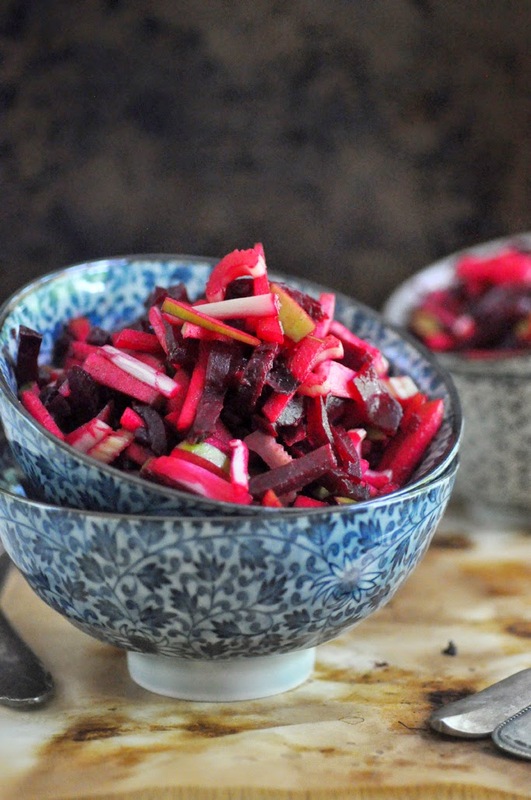 I love to make big batches of this salad and keep it in the fridge. You'll find me eating it straight out of the container standing in front of the fridge. That's how good and refreshing it is. Top it up with some crumbled feta cheese or roasted walnuts if you want to make it really fancy. Wash the beets and roast them in the oven until tender, depending on their size between 20 and 30 minutes. Set aside to let cool. Meanwhile, core and thinly slice the apples. Cut the slices into matchsticks and toss them in the lemon juice. Cut the celery into matchsticks and add them to the apples. Peel the beets, and cut them into matchsticks too. Add to apples and celery. Whisk olive oil and honey together. Season with salt and pepper. Pour dressing over the salad and mix until well coated. Keep the salad refrigerated for at least 20 minutes for the flavors to combine. Best served cold.